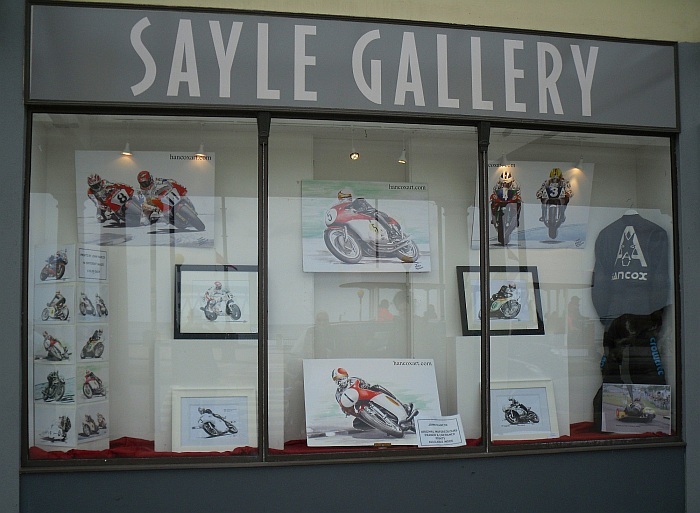 Our exhibition of motorcycle racing art is open at The Sayle Gallery throughout TT fortnight! John will be making appearances at the gallery during the exhibition to chat about his work and sign artwork. We have a selection of greetings cards, prints and mugs as well as original artwork on display – hope to see you there! 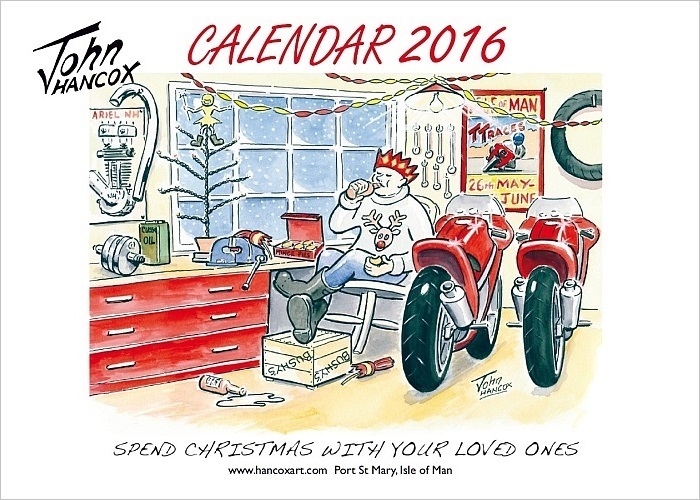 We’re pleased to anounce that our 2016 Motorcycle Cartoon Calendar is now available! 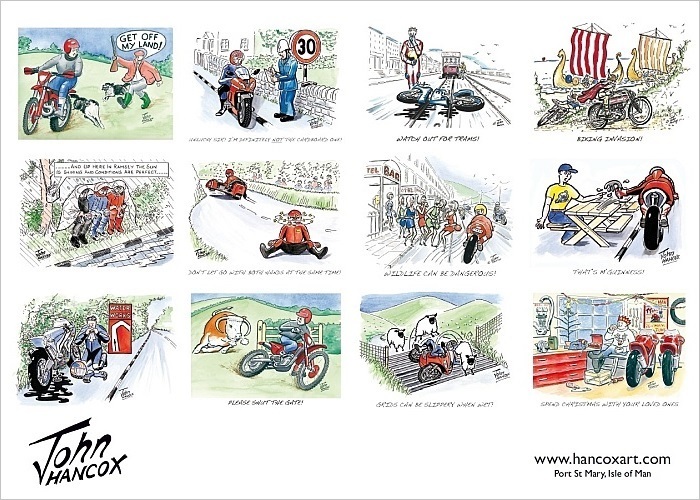 The calendar runs from January 2016 – January 2017 and features thirteen of our motorcycle cartoons including some brand new designs. See us at Port St Mary ‘Mad Sunday Vintage Rally’! 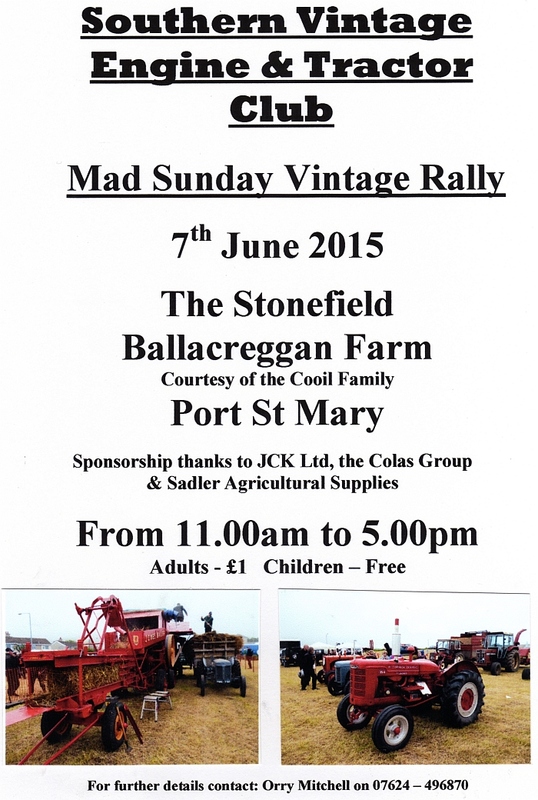 The Hancox Art trade stand will be at the Port St Mary ‘Mad Sunday Vintage Rally’ on Sunday 7th June. We’ll have our greetings cards, mugs and prints for sale and John will be on the trade stand throughout the day to chat and sign artwork. The Vintage Rally is a well established annual event and attracts a wide range of exhibitors and traders so there’s always plenty to see and do. The gates open at 11.00am, free entry for children and only £1.00 for adults. John’s been busy with the brushes and we’ve just added two new paintings to the website! 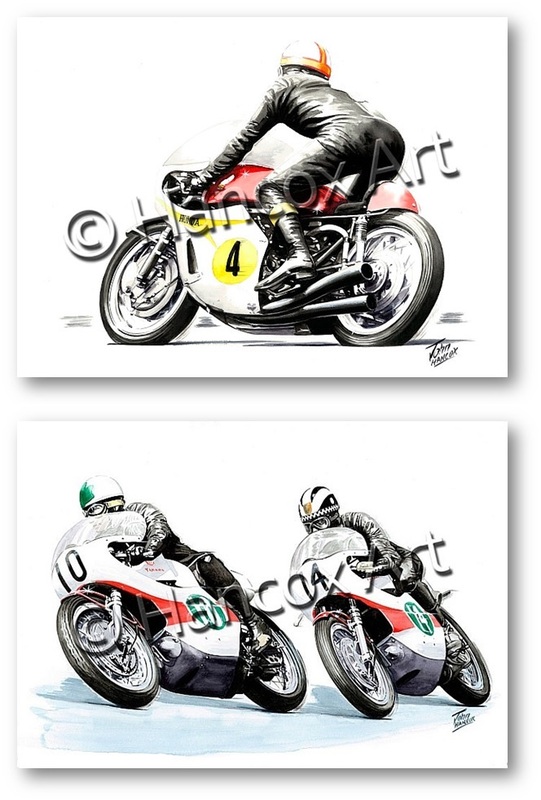 The pictures feature racing greats, Mike Hailwood (1967 Honda 500 Four), Bill Ivy and Phil Read (1968 Yamaha 250). Click here to view the paintings in our store. Last few Cafe Racers 2015 calendars left! Still looking for a great Christmas gift for a classic bike / cafe racer / motorcycle enthusiast? We still have a few Cafe Racer calendars available in our store and they make a great gift or something nice to treat yourself to. Our 2015 Cafe Racers Calendar runs from 1st January 2015 through to 31st January 2016 so you get 13 months worth! Guy Martin’s 2015 Calendar featuring artwork by John Hancox! 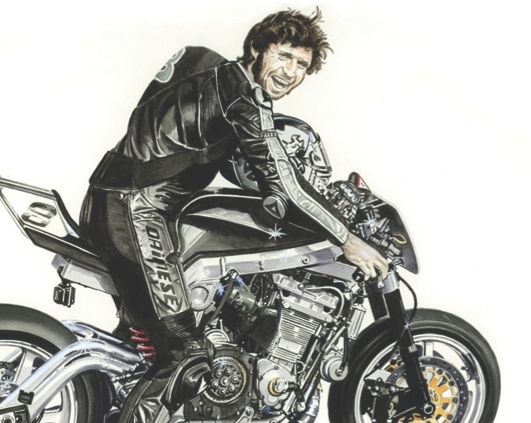 Guy Martin’s 2015 calendar is now available to order and we’re proud to announce that it features John’s painting of Guy on his Pikes Peak class winning machine. £1 per calendar sold goes to the charity Spinal Research and every calendar bought gives entry to Guy’s prize draw. 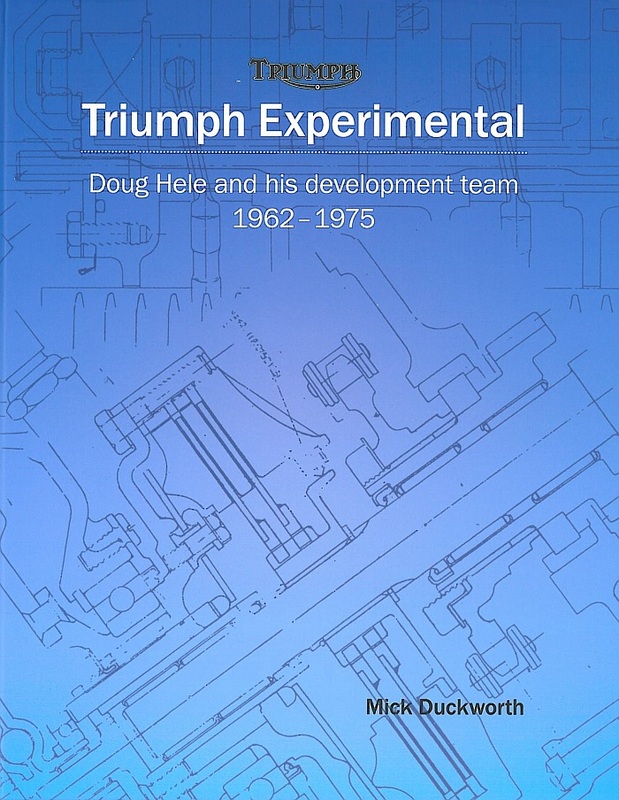 Mick Duckworth’s new book, Triumph Experimental: Doug Hele and his development team 1962-1975, tells for the first time the full story of chief development engineer Doug Hele and his men at Triumph’s Meriden motorcycle factory (and later at the Norton-Triumph research centre). Produced for Biker Miles by Oracle Publishing Ltd, this 208-page hardback contains 165 illustrations, some of them explanatory line drawings specially commissioned from artist John Hancox. It’s a must-read for anyone fascinated by development engineering or curious about the old British industry, as well as classic Triumph bike fans. We’re very proud to announce that our Exhibition of Motorcycle Racing Art opens at The Sayle Gallery on Saturday 16th August. There will be a large selection of John’s original artwork as well as prints, greetings cards and mugs on display and for sale. Admission is free and you can keep up to date through the exhibition’s Facebook Event Page. 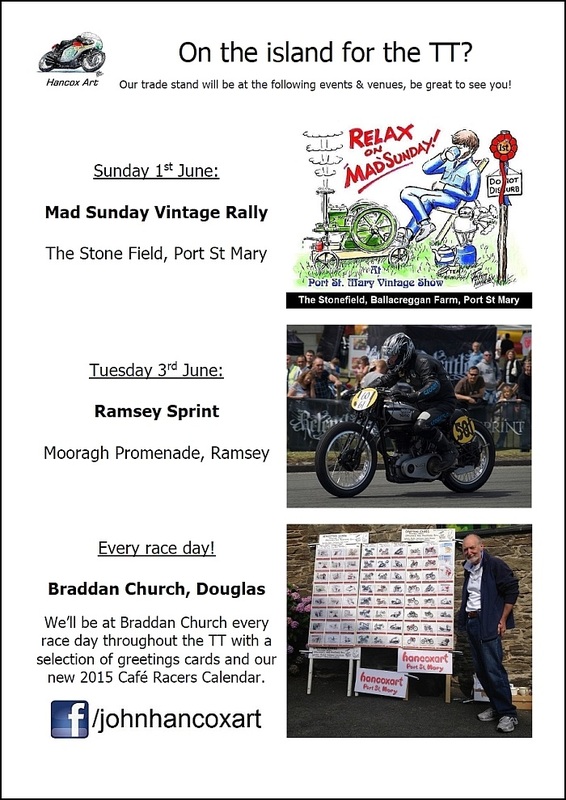 Hancox Art TT 2014 Schedule! 2015 Cafe Racers Calendar Available Now! 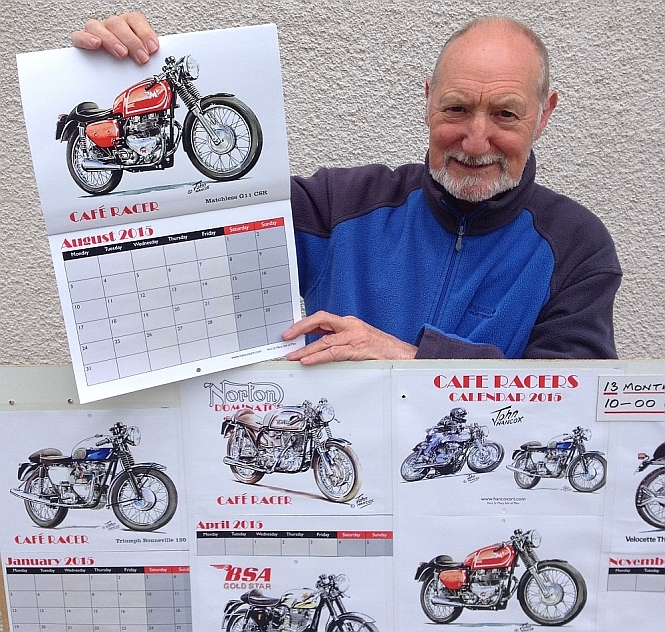 We’re very pleased to announce the launch of our 2015 Cafe Racers Calendar! 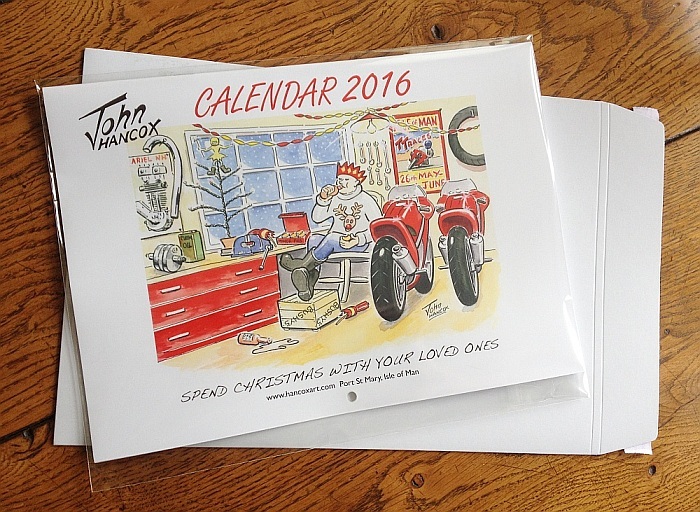 It’s a 13 month calendar (from 1st January 2015 through to 31st January 2016) featuring a selection of John’s cafe racer artwork.